Some people would pay to watch Bette Midler eat. Well, here's your chance! Hello, Dolly! has made a glorious return to the Great White Way in a delightful production. Directed by Jerry Zaks with music and lyrics by Jerry Herman and book by Michael Stewart, Hello, Dolly! is a cheery production that brings back nostalgia for classic musical comedy. Based on Thornton Wilder's The Merchant of Yonkers, Hello, Dolly! follows Dolly Gallagher Levi, a widow who makes a living through meddling. As a premiere matchmaker, Dolly is seeking a wife for grumpy Horace Vanderelder, but it’s really she who plans to marry him herself. Meanwhile, Horace’s niece, Ermengarde, is being courted by Ambrose Kemper while his clerks, Cornelius Hackl and Barnaby Tucker, take a trip to New York City and find an adventure alongside Irene Molloy, a hat shop owner, and her shop assistant Minnie Fay. 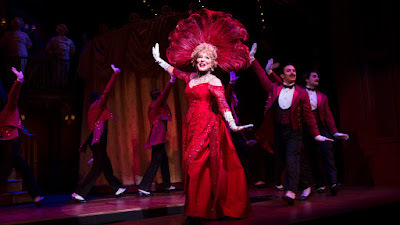 With an abundance of old-fashioned charm, Hello, Dolly! gleefully embraces the whimsy of romance. It’s hard to do this show wrong. The story is silly. But we forgive it simply because of the nostalgia attached to it. Rather than reinvent the show, Jerry Zaks and his team don’t rely on spectacle to tell the story like some of their neighbors do. They allow the show to sing for itself. Scenic designer Santo Loquasto provides some moving parts to the design, (and one offbeat court room scenic piece) but the intrigue for most of the crowd are the painted drops. No other show in today’s theatrical landscape could ever get away with a painted drop. But this show can. Playing double duty with costumes, Loquasto provides beautiful period fashion alongside some iconic looks. Nothing quite beats the hat parade as the cavalcade marches on in all its glory. Dolly Levi is an iconic role. It’s synonymous with a handful of actresses, most notably Carol Channing and Barbra Streisand. But ladies, watch out. Bette Midler is coming for your glory. There’s only one way to describe her: divine. You can say she put herself into the role, but isn’t that what we wanted? Midler knows how to hit the comedic beat without batting an eye. It comes naturally. But it’s when she tackles Michael Stewart’s soliloquies that Midler radiates heart. Infusing just a tinge of color, the tenderness in which she delivers the text layers her Dolly. As the man she drives crazy, David Hyde Pierce’s Horace is assertively funny. With a lip quiver that rattles his moustache, Pierce plays into the caricature elements of Horace. With an profusion of subplots to explore, this ensemble of supporting players was more than capable of helping carry the show. Gavin Creel and Kate Baldwin as Cornelius and Irene were delightful. But the real scene-stealers were Taylor Trensch as Barnaby and Beanie Feldstein as Minnie. Taking on the more comedic sidekick parts, Trensch and Feldstein played into the grand youthfulness of the duo, yet they were some of the more honest portrayals on stage. Taylor Trensch is truly the unsung hero of this production. It takes a special performer to make a minor ensemble character come to life and steal the show. Jennifer Simard as Ernestina did what very few can. Simard’s brash and unashamed Ernestina kept the audience on their toes. You never knew what antics were coming from her next the moment the booth curtain opened. Between the show itself and the superstar taking on the title role, this production was going to find itself getting uproarious applause. I’m sure it happens every night, but the audience applauded for everything. The overture starts: applause. The curtain rises: applause. Bette Midler steps on stage: applause. David Hyde Pierce steps on stage: applause. The costumes are revealed for “Put on Your Sunday Clothes”: applause. See a trend? But it’s incredibly rare to find a standing ovation occur in the middle of the show. And that happened at the conclusion of the titular song. As they say in sports, “and the crowd went wild.” Like the commercial says, there will be people who saw Hello, Dolly! and people who did not. Hello, Dolly! is a sweet production that stays inbounds. If anything, it brought Bette Midler back to musical theater. And that’s a triumph right there.